Free Shipping Included! DotPen Pro - World's Best Rechargeable Active Stylus Pen for iPad, iPhone, and Most Android Tablets and Smartphones. Machined Aluminum Housing With 1.9mm Durable Tip. by Dot-Tec at DJ Luu. Hurry! Limited time offer. Offer valid only while supplies last. DotPen Pro Features: The DotPen Pro is the newest version of the DotPen lineup. DotPen Pro redefines drawing and writing on tablets and smartphones. The DotPen Pro is the newest version of the DotPen lineup. DotPen Pro redefines drawing and writing on tablets and smartphones. DotPen Pro actually feels and writes just like a pen, does not require special software, and works with any iOS and most Android touch interface device. DotPen Pro feels like a real pen and features a unique 1.9 mm rubberized Active-Quill tip producing amazing fluid pin-point writing accuracy. Powered by a USB rechargeable battery, DotPen Pro provides hours of continuous latency-free drawing and writing. Enhanced with "MagicTouch" technology, DotPen Pro does not rely on special pre-installed software or specific apps. With a touch of a button, DotPen Pro instantly activates to work across any device that uses capacitive touch. DotPen Pro works independently of special software or special settings in apps. So it virtually works with any app, including popular apps such as ZoomNotes, Evernote, Paper by FiftyThree, ProCreate, and many more. Many capacitive touch pens have cheap rubber tips that easily fall off and feel mushy and sluggish. DotPen Pro introduces a unique Active-Quill writing tip. Crafted from a durable thermoplastic, the Active-Quill tip has an extremely low coefficient of friction which glides effortlessly over glass displays with zero latency. This precision fine point tip feels remarkably like a real pen and provides stunning clarity of resolution for both drawing and writing. DotPen Pro is made of precision CNC machined anodized aluminum alloy and a durable soft-touch rubber writing grip. Built to last and built for effortless writing and sketching. NOTE: Does not work with all Android tablets and smartphones, iPad Pro or Windows devices. 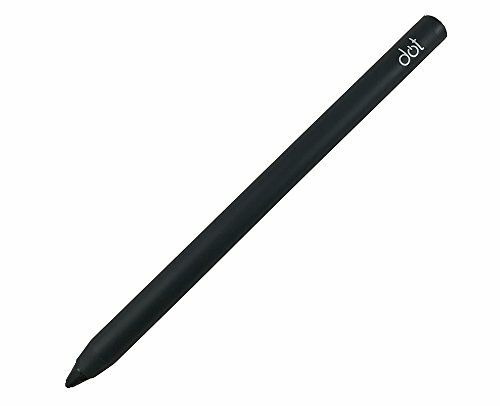 This is the newest generation DotPen active stylus. Works with most popular devices: DotPen Pro is compatible with iPad, iPhone, and most Android tablets and smartphones. Works with the top apps: DotPen Pro works works with any app, including popular apps such as ZoomNotes, Evernote, Paper by FiftyThree, ProCreate, and many more. 1.9mm Active-Quill 2 : DotPen Pro's unique Active-Quill 2 is the latest generation tip crafted from a durable thermoplastic, the Active-Quill 2 tip has an extremely low coefficient of friction which glides effortlessly over glass displays. Built to last : DotPen Pro is made of precision CNC machined anodized rubberized aluminum alloy with a durable soft-touch rubber writing grip. If you have any questions about this product by Dot-Tec, contact us by completing and submitting the form below. If you are looking for a specif part number, please include it with your message. Evach Active Stylus Digital Pen 1.5mm Ultra Fine Tip iPad iPhone Samsung Tablets, Work at iOS Android Capacitive Touchscreen,Good Drawing Writing on IPAD, White.